Verse 23 – Now when he was in Jerusalem at the Passover, during the feast, many believed on his name, beholding the signs which he did. Verse 24 – But Jesus did not trust himself unto them, for that he knew all men. Verse 25 – And because he needed not that any should bear witness concerning man; for he himself knew what was in man. The group had faith in Jesus because of the miracles they had seen or heard about. But they did not have the life-saving faith of accepting him as the Lord and Savior or the Baptism of being born again and all things becoming new. They saw him as the leader of a mighty army that has come to set them free from Roman Rule instead of the Son of God that has come to offer eternal life. Jesus, knowing men’s hearts, knew the ones that was giving him glory and honor now would soon be denouncing his name, scorning him, and yelling, “Crucify Him, King Of The Jews”. Now while in Jerusalem, at Passover, a man named Nicodemus, a Pharisee and a member of the ruling council came to Jesus during the darkness of the night. When Nicodemus truly believed that Jesus was the Son Of God, he spoke and acted boldly for the Messiah. He knew the Kingdom of God was going to for everyone and not just the Jews. He knew the Kingdom was going to be restored on earth and God would rule it. Nicodemus also knew he had to be born again! Jesus spoke of being born of water and baptism. Verse 3 and Verse 5 are exactly parallel. 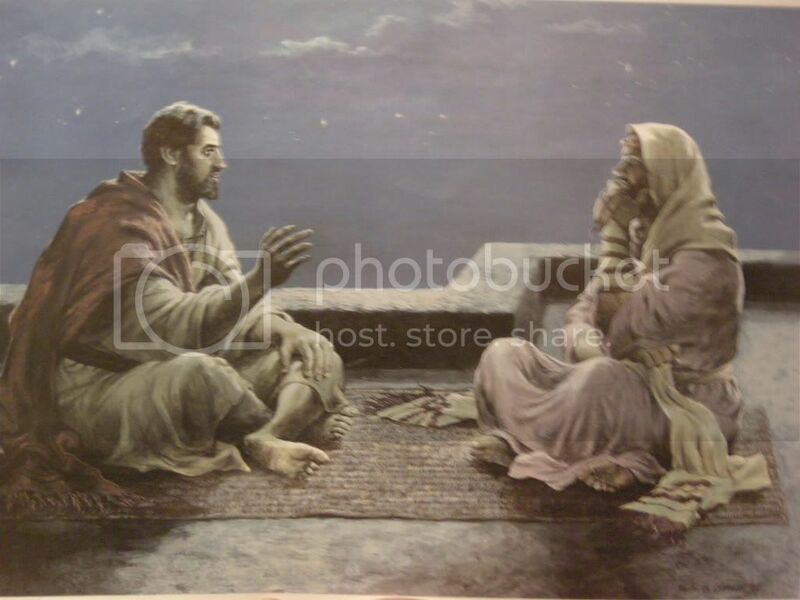 Jesus is restating His point so Nicodemus can understand what He meant the first time. The restatement shows that “born again” means, “born of water and the Spirit.” Verse 5 is not describing two different births, as many people claim. It is describing further the new birth, stating that the new birth involves two elements: water and Spirit. Other important passages regarding the new birth help us understand this one. One can only be born again by obeying the gospel: 1 Peter 1:22-25. Hearing and believing gives one the right to become a child of God, but does not automatically make one a child of God: John 1:12. To be born again, one must come into Christ : 2 Cor. 5:17. To come into Christ and thereby become a child of God, one who believes must be baptized : Rom. 6:3,4; Gal. 3:26,27 (see also Mark 16:15,16; Acts 2:38; 22:16; 1 Pet. 3:21). “Born of the water” must refer to water baptism. Reason being: (1) Baptism is the only command in the New Testament that requires the use of water (Acts 8:35-39; 10:47; John 3:23; Heb. 10:22; etc.). (2) Many other passages, already cited, show that water baptism is essential to forgiveness. (3) Further, other passages, already cited, show specifically that water baptism is an essential element of the new birth. (4) We will also notice later several verses that tie baptism to hearing the gospel like John 3:5 does. Some people claim the water of John 3:5 refers to the physical birth (the “water” surround-ing the baby in the mother’s womb). However, (1) the parallel to v3 (above) shows that v5 is not talking about two separate births nor about physical birth at all. It is explaining two elements involved in one birth, the new birth. (2) “Water” is nowhere in the New Testament used to refer to physical birth. (3) V6 refers to physical birth as born of the “flesh.” If physical birth is meant in v5, why say “water” in v5 and then say “flesh” in v6? Why not use the same term both times if He meant the same thing? (4) Physical birth is mentioned in John 3; but it was brought up, not by Jesus, but by Nicodemus as a result of his confusion and misunderstanding (v4). Jesus restated the truth about the new birth (v5), then He contrasted the physical birth to the new in v6. But He never included physical birth, along with the new birth, as something essential to enter the kingdom in v5. He discussed physical birth only to correct the confusion Nicodemus had introduced. So Jesus here emphatically stated that baptism is essential to enter the kingdom of God. No one can be born again without it. When people seek to deny that Jesus ever taught the necessity of baptism to salvation, they need to consider carefully this passage along with Mark 16:16 and the other passages cited above. The Holy Spirit revealed the message of the gospel, which one must learn and believe in or-der to be forgiven. The word is the “seed” by which one is born again (1 Peter 1:23; etc.). The word is the “sword of the Spirit” (Eph. 6:17). It is the tool or means used by the Spirit to accomplish His word in conversion (2 Peter 1:21; Eph. 3:3-5; John 14:26; 16:13; 1 Cor. A manifestation of the Holy Spirit is the gift of speaking in a heaven language called “tongues’. Many denominations do not practice this. However, the Pentecostal do. After the meeting with Nicodemus, Jesus went about baptizing like his cousin, John The Baptist. For those who seek God’s face and accepts His son Jesus, eteranl life will be given. For those who reject the Son of God, will face eternal damnation. In closing, I would like to leave you with this thought: Mark Twain once said, “It is not what I don’t know about the Bible that troubles me, it is what I do know!” He was not doing what he knew. This is the real problem. Most people know what is right but they do not do what is right. The reason they do not do what is right is because there is something wrong about who they are. That is true of us all. Previous Post: Redneck at it’s best..Very freakin’ funny!!! The short answer to your question is “absolutely not”. Salvation comes “by grace through faith” (Eph.2:8-9). And whatever is of faith is by definition not of “works”, that is, not as a result of something we have done (Rom.3:28; cf. Gal.2:16; Eph.2:9). God calls upon sinful, unsaved mankind to repent of dead works of the flesh (Heb.6:1; cf. Matt.4:17) and turn to Him by putting our faith in the person of the Son of God and in His work on the cross for us, dying for us and thereby cleansing us from our sins. So to add water baptism or any other condition to salvation by definition makes the process one of works rather than of grace. In fact, anyone relying as a guarantee of salvation on the fact that they were baptized with water is badly mistaken. Salvation is by faith in Jesus Christ, pure and simple, not by any ritual or organizational membership. Whenever anyone attempts to add to God’s requirements for salvation they are putting those who listen to them at risk, because anyone who thinks they are saved because they have been baptized is wrong according to scripture, and if such a person is not a believer in Christ, then it is not only a matter of having a warped view of salvation but of not having salvation in the first place. But whatever I had gained [in my former godless life], compared to Christ I have come to consider these things as losses. Indeed, I consider everything to be a loss compared to the surpassing importance of knowing Jesus Christ my Lord, for whose sake I have suffered the loss of everything, and consider [everything I have lost] as garbage, compared to gaining Christ, and being found in Him – not having a personal righteousness [developed] through [following] the [Mosaic] law (i.e., works) – but having that righteousness [that comes] through faith in Christ, that righteousness [that comes] from God based on faith. Water baptism is also known as John’s baptism. This was a ritual closely associated with the return of the Messiah and the preparation of the Jewish nation for that return, preparing the hearts of the willing for Jesus’ arrival through an act that acknowledged repentance from sin. Jesus would change the ritual into a reality when He, having accomplished eternal redemption of sin at the cross, ascended on high and made possible the predicted “baptism of the Spirit” (Matt.4:11), the true baptism of the Church whereby everyone who believes in Jesus since the day of Pentecost is both anointed with the Spirit and made one with Jesus through the Spirit. This is the “one and only” baptism of which the scriptures speak which comes as a result of the “one and only” faith, the faith we have and maintain in Jesus Christ (Eph.4:5). John answered them all and said, “I am [symbolically] baptizing you with water. But One who is more powerful than me is coming, [One] whose sandal thong I am not sufficient to untie. He will baptize you with the Holy Spirit ….. and with fire! His winnowing fork is in His hand, [ready] to cleanse His threshing floor and gather the grain into His barn, but He will burn up the chaff with unquenchable fire. One major problem with water baptism is that if you ask the people and groups who do it what it means you are likely to get a variety of widely divergent answers. This can only show that there is a problem with the symbolism behind present day water baptism as it is currently practiced. At best it may represent our new relationship with Jesus and our faith in Him, but this is usually very confusingly explained in ceremonial baptisms. The real impression that water baptism leaves upon people is that this is some sort of essential ritual without which you can’t get to heaven – exactly the thing you are asking about. And while there is nothing in the Bible to even suggest that, many groups brazenly proclaim just that. “Water-baptism as essential to salvation” is a very dangerous heresy, because as explained above it can lead people to relying upon a human ritual instead of God’s spiritual realities. But it also has the added danger of making people who buy into this deceit entirely dependent upon the people doing the baptism. After all, if baptism were essential to salvation, then you better “have it done right”. If it’s essential for salvation, then it must be imparting some special grace. And if all this is so, then it would stand to reason that only those who have the special “in” with God necessary to water-baptize correctly can save you. So a person who buys into this deceit of necessity becomes enslaved to the group or persons who are making these claims. If someone else other than God is in control of your salvation, then they become a “god” to you (and this is typical modus operandi in all cults). In my experience and observation, water-baptism, while potentially harmless because it is unnecessary, has caused more false guilt and more mistaken reliance upon human beings, ritual, and far from godly organizations than perhaps any other fallacy. We do want to do what God wants us to do, but apart from Jesus’ command to His disciples that they should be baptizing (note, not “be baptized” but “baptize others”), there is nothing in scripture that commands us to partake of this ritual. And when we look at it carefully, we find that Matthew 27:18-20 is actually also talking about the baptism of the Spirit. For water baptism could never (as the Greek text literally says) baptize us “into the persons”of the Father, Son, and Holy Spirit – but Spirit baptism does precisely this, making us one with Christ as Christ is one with the Father and the Spirit. Clearly then, we are “in Christ” and have the eternal life that frees us from the “law of sin and death” through the Spirit’s baptism, not through any water ritual. No human being can “put us into Christ”, making us one with Him. Only God can do that, and does just that through the baptism of the Spirit whenever anyone puts their faith in Jesus Christ. Water baptism these days almost always takes place long after a person has believed in the Lord, and long after those who gave the gopsel have carried out our Lord’s command to be “baptizing them into” His person. By sharing the gospel, people believe in Christ unto salvation and are then baptized into Him, becoming one with Him and the Father and the Spirit through the Spirit’s ministry of baptism. No amount of water administered through human hands could ever hope to accomplish anything of the sort. I hope that this answer will prove of some help to you. I know this particular subject has long been a debate among scholars and different denominations. I know we are saved by grace and not by works. However, the scriptures I am reading and which is listed below, is telling me that water baptism is essential. Unless I am greatly mistaken, the following scriptures do state that water Baptism is essential. I realize it is also symbolic in representing we died with Christ and we are reborn when we are raised from the water. Another thought, why did John the Baptist baptize so many people including Jesus Christ? Why did Jesus command his disciples to go to all nations and baptize in the name of the Father, The Son, and The Holy Spirit? Matthew 3:13-16 It was imperative for Jesus to be baptised to fulfill righteousness as was His crucifixion. 1st Peter 3:21 A symbol of the baptism that saves you, again Christ had to do it to fulfill rightousness for us. Matthew 28:19-20 it says nothing about water. When we baptise in water we use the Father Son and Holy Ghost but that is tradition men has established. I think that the baptism of Christ was to fulfill righteousness. I think John the baptist baptised in the day just like we do today, as an outward exoression of an inward Faith. Baptising in the name of the Father Son and Holy Spirit to me is of the Spirit and not water. I am not saying the “WATER” will wash away one’s sin. Only the blood of Jesus can do that. This is accomplished by admitting with your mouth that you are a sinner, accept the Lord as your personal savior. We are not talking about spiritual baptism but water baptism. That is why John the Baptist baptized. That is why the sinless one, “Jesus Christ” was baptized, and that is why Jesus commanded his disciples to go throughout the world and baptize. First we receive salvation by grace and not by works. Secondly, we are baptized with water which signifies we died with Christ and resurrected. Lastly, we are baptized in spirit by the Holy Ghost. Along with continuously approving ourselves, the scriptures state this is the sequence of events to fulfil ourselves in the Lord. As I mentiond, same as you, this topic has long been debated. Individuals can read the scriptures and arrive at their own conclusion. I don’t need to allow anything. Based upon reading God’s Holy Word, all individuals can decide where they stand and their relationship with God.